Δελτίου τύπου: «Legion from Augusta, Georgia, USA was founded back in 1985 by multi-instrumentalist Doug Calloway. His vision to deliver a powerful mixture of Heavy/Power and Speed Metal performed by a fully dedicated band was clear since the very first rehearsal with the vocalist Loy Mitcham. From 1985 until 1994 Legion recorded lots of material. Unfortunately due to various difficulties only an official independent LP tape release has seen the light of day back in 1991. 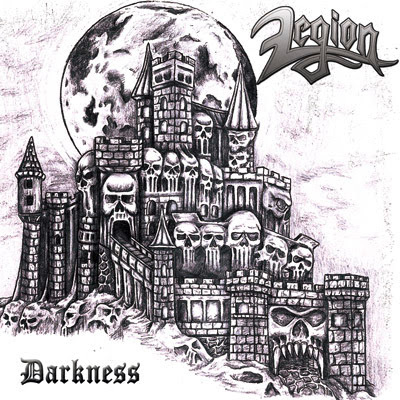 An original copy of the "Darkness" LP-tape is one of the wildest dreams of the few people worldwide who know about Legion's existence. Arkeyn Steel Records have managed to track down this magnificent band. But we knew from the very first time that a simple re-release of the "Darkness" LP tape wouldn't do full justice. To release their entire back catalogue was the main goal. It seemed impossible but we finally made it. So here they are: Two separate CD releases representing the Legion saga. The first one is called "Darkness" and it will feature the entire "Darkness" LP-tape (1991) plus the band's fourth unreleased album "For We Are Many" (1994). More than 77 minutes of music, the Legion way. The second release is called "Bible Of Stone" and it will feature the band's unreleased "Bible Of Stone" album (1989) plus their 1985 2-song demo. A wide selection of rare and unreleased tracks, 4 track and rehearsal recordings from the band's first era (1985-1987) is also included. More than 74 minutes of music, capturing the band's first era! Everything is re-mastered direct from 24track tapes packed with lyrics, info and bio. Handmade cover artwork by Doug Calloway himself completes the puzzle giving to the reissues this obscure, fantasy artistic touch that fits extremely well with the band's vision. Legion is not just another lost Metal band from the 80s. Legion is the great example of force, passion and dedication to steel, transformed into music. No, back in the day Legion got no big record label and big budgets on their side, they got no promoters and managers to spread their music around.